Patti spent most of her life as a competitive athlete, in the last six years she has transitioned from competition to fun. She loves surfing, skiing, and mt. biking. 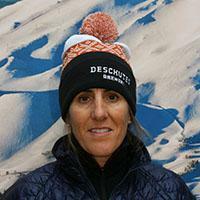 Patti moonlighted ski patroller for 12 years and a level 1 alpine race coach for 8 years at Mt. High Ski Resort. Patti enjoys almost all terrain when skiing but loves being off piste. Patti and her husband, Lex, own a software company and live in Bend with their two boys and 3 dogs. This was Patti’s first year boot fit testing and she had a blast!